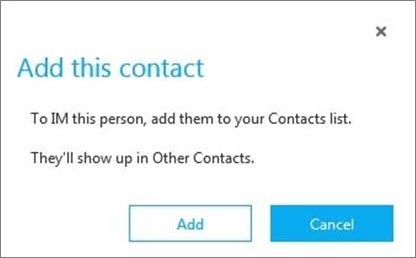 In Skype for Business, your contacts are the online identities of the people you communicate with a lot—both within your organization and outside of it (if they have a Skype account). Either way, you can add them to your Contacts list so they’ll be just a click away. Add people by name, by instant messaging address, or, if they are in your organization, by phone number. Every contact you add is assigned membership in one or more of your contact groups. Here’s the quick way to add a contact. In the search box on the Contacts view of the Skype for Business main window, type a name, IM address, or desk phone number if they are in your organization. As you type, search results will start appearing below the search box, and the tabs will change from Groups, Status, Relationships, and New, as shown in the following image. to My Contacts and Skype Directory, as shown in the following image. If the person you're searching for is in your organization, keep the My Contacts tab selected, which is the default. When My Contacts is selected, Skype for Business searches in your organization's address book. If the person you're searching for is not in your organization, but you know they have a Skype account, click the Skype Directory tab to search for them among the millions of Skype users out there. Knowing their Skype ID and location helps narrow the search quickly. You can also search using their email address or Microsoft account, for example, John@outlook.com. NOTE Your administrator enables or disables the Skype Directory search feature in accordance with your organization's search policy. If you don't see a Skype Directory tab like the one shown in the preceding screenshot, you won't be able to search for Skype users. When you see the listing for the person you want to add, point at their picture or picture display area. If they are in your organization (My Contacts), and you want to add them to one of your groups, click More Options, and then choose Add to Contacts List and select one of your groups, or choose Add to Favorites. If they are a Skype user, and you want to add them to one of your groups, click Add to contacts, and then choose one of your groups or the favorites group to add them. 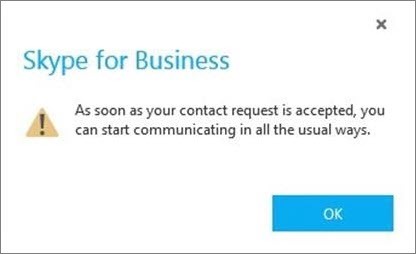 When you add a Skype contact in Skype for Business, you receive a notification saying that the Skype user has to accept the request before you see their presence and start communicating with them in Skype for Business. 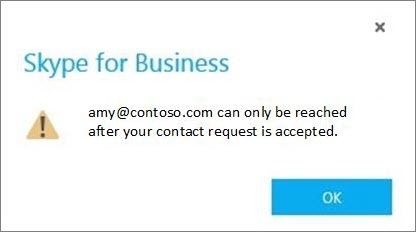 If you send a request and try to communicate with a Skype user before your request has been accepted, you will receive the following notification. If you haven't sent a request and try to communicate with a Skype user, you'll receive the following notification. NOTE Some people might have an organization account and a Skype account. So if you work with someone and are also friends with them, you might want to add both of their identities to your contacts.